This suggests children with autism have to recruit and rely on more conscious, effortful motor planning because they are not able to rely on the cerebellum to automate tasks. “Tapping your fingers is a simple action, but it involves communication and coordination between several regions of the brain. These results suggest that in children with autism, fairly close regions of the brains involved in motor tasks have difficulty coordinating activity. If decreased connectivity is at the heart of autism, it makes sense social and communication skills are greatly impaired, as they involve even more complex coordination between more distant areas of the brain." The study results also support previous studies which tie autism to structural and functional brain underconnectivity. See for example Functional and Anatomical Cortical Underconnectivity in Autism: Evidence from an fMRI Study of an Executive Function Task and Corpus Callosum Morphometry in Cerebral Cortex, June 13, 2006. Water Balloon Season Is Back! Breaking water balloons is lots of fun for Conor but sometimes it isn't as easy as you'd think. "the newly identified gene variants found to boost autism risk are involved in facilitating communication between brain cells -- making more credible the suggestions from other autism experts that autism or ASDs are due to abnormal connections between brain cells early in development." Dr. Hakonarson also points out that having the genetic variant does not automatically mean that autism will result. Other genetic and environmental factors are also involved. "If you think about autism as a jigsaw puzzle with 500 pieces, each of these findings is an 'edge' piece. But many edge pieces are needed to make progress. It would be a mistake for people to read this and think this is only about genetics. Almost everybody agrees that autism is a collection of different disorders. Some of them may be heavily genetic. But I think most experts would say the bulk of autism is the result of both genetic and environmental effects that are interacting in some way that we have yet to fully describe. This begins to fill out the genetic part of the equation." I was interviewed by Elizabeth Svoboda for her Salon.com feature on Neurodiversity "I am not a puzzle" and I am impressed by the balance shown in the article for which that interview was conducted. I have complained in the past that Neurodiversity gets a free ride from the mainstream media (especially Canada's publicly funded CBC) and is permitted to misrepresent the nature of autism. Few in the media even question the right of some persons with Aspergers or High Functioning Autism to speak on the behalf of all autistic persons including lower functioning persons with Autistic Disorder, like my son, with whom they have very, very little in common. In addition to presenting different perspectives Ms Svoboda's interview allowed some Neurodiversity leaders like Ari Ne'eman, the ASAN leader with Aspergers Disorder, to go on the public record with their distorted representations of Applied Behavior Analysis, the empirically backed autism intervention that has helped so many children with autism disorders and serious deficits to acquire skills and reduce dangerous self injurious behaviors. As his quotes in the Salon article show, Ari Ne'eman relies on outdated caricatures of ABA, arguing erroneously and with nothing to back it up, that ABA, as practiced today, still relies largely on aversives. I thank Ms Svoboda and Salon.com for practicing real journalism. Unlike the CBC, which routinely promotes Neurodiversity on its English and French radio and television programs, En jeux, Quirks and Quarks and prime time news features like "Positively Autistic", Salon. com has offered a balanced, professional view of this misguided ideology and some of its leaders. Psychiatrists from the University of Utah School of Medicine in Salt Lake City compared medical records for 132 children with autism with those of 13,200 children without the disorder who were also born in 1994. They found that autism was twice as common in babies who weren’t born head-first and 68 percent more common in those born to mothers older than age 34. When studies such as this are publicized it is hard not to look at your own autistic child's delivery. His mom was not over 34 at the time but Conor was a breech baby, delivered by cesarean section. The walking trail was flooded over but Main Street was high and dry so Conor and Dad headed to the Lawrence Amphitheatre on the Nashwaaksis Commons for some "Circle Place" fun. After a long winter and an incredible growth spurt Conor's balance needed a little work but it didn't take long. Couldn't do much trail walking with Conor this weekend. 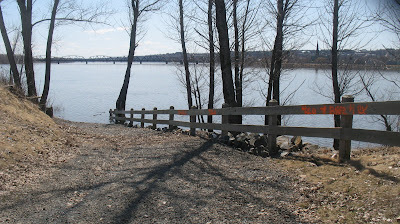 The Fredericton North Riverfront Trail was flooded over in many areas. Still, if this is all we get for flooding this year ... I'm not complaining. Autistic artisit Stephanie Lynn Keil has produced a YouTube video about her life and how she sees the world. Autism: My Life is at times sad but also hopeful and always beautiful. I recommend that you take a few minutes out of your day to view, and enjoy, this personal and moving video. You can see Autism: My Life and Stephanie's other art and ideas at her blog site A Grand Illusion. There are some who believe, as an article of faith, that autism is 100% genetic. They cling to this belief even though the fact that one identical twin has an Autism Spectrum Disorder diagnosis does not necessarily mean that the other twin will also have an ASD. For many with the "it's gotta be genetic" mindset no explanation, no study, no evidence will budge them. "Autism is a complex disorder and it would be naïve to assume there's a single mechanism that can cause it. It's most likely the cumulative effect of several factors, including genes, metabolism, and the environment. We believe we have identified one of those factors." I am pleased any time I see such a sensible perspective offered about autism by someone with the knowledge and credibility to have his comments be given serious weight and consideration. Here in Canada our autism research community, and our CIHR, are dominated by a small Montreal based neuroscience elite that still leans heavily towards the outdated "it's gotta be genetic" view of autism that Teresa Binstock cautioned against a decade ago. There is an Autism Research Paradigm Shift taking place ... in the United States ... if not in Canada. Once again, I must thank our American friends for offering informed, sensible information about the nature of autism disorders, their possible causes and interventions. Jim Carrey, knowing full well the malicious attacks he would receive from the Neurodiversity "science" bloggers, (his partner Jenny McCarthy pushes the ND crowd into a full scale lather whenever she speaks) has expressed the very reasonable view that there are questions remaining to be answered about vaccines and their possible role in causing or triggering autism. The comment titled The Judgment on Vaccines Is In??? was published yesterday on the Huffington Post. In no time the Neurodiversity hounds were unleashed to smear and slime Mr. Carrey with irrelevant personal attacks and distorted summaries of the existing state of knowledge about vaccine and autism issues. In less than 24 hours Kevin Leitch of lb/rb " fame" posted an attack piece on Opposing Views and his fellow Neurodiversity ideologue Orac posted his own hatchet job on his inappropriately named Respectful Insolence blog (there is nothing respectful about the manner in which Orac expresses his opinions about those who do not share his ND ideology). In fairness both ND bloggers do try to address some of the points made by Mr. Carrey but those points do not refute Mr. Carrey's assertion that the "judgment is not in" about vaccines and autism. The arguments they do make are lost in their sarcasm and anger. Mr. Leitch, under the apparent delusion that he is qualified to do so, even takes time to smear Dr. Bernadine Healy former NIH and American Red Cross head who has, like Mr. Carrey, pointed out the limits of the epidemiological studies relied on by Mr. Leitch and others as being conclusive and who has called for more research on possible vaccine autism connections. The Interagency Autism Coordinating Committee has, after some false starts, quite properly indicated in its strategic plan for autism research that environmental issues, including possible vaccine autism issues, should be researched. Even if the IACC included vaccine autism research to placate those who question vaccine safety in connection with autism it is a step in the right direction. The anger of Mr. Leitch, "Orac" and others who have closed their minds should not dissuade the IACC or anyone else with a genuine interest from trying to understand the ever rising autism epidemic that affects our children. Their very unscientific mindsets should not prevent the necessary research from being done. Evidence Maternal Antibodies can Trigger Autism - What starts with V and can Trigger Maternal Antibodies? As reported in the following excerpt from a EurekaAlert news release, recent mice studies add to previous research indicating that maternal antibodies can trigger autism. Can anyone think of a word starting with the letter V that can trigger antibodies .... and therefore autism? New studies in pregnant mice using antibodies against fetal brains made by the mothers of autistic children show that immune cells can cross the placenta and trigger neurobehavioral changes similar to autism in the mouse pups. A report on the research from investigators at the Johns Hopkins Children's Center published online in the Journal of Neuroimmunology expands on a 2008 report from the same team showing that mothers of autistic children tested positive for fetal brain antibodies. Antibodies are proteins the body naturally makes to attack foreign tissues, viruses or bacteria. Because a growing fetus is not "rejected" by the mother's immune system even though some of its DNA is "foreign" (from the father), scientists have long suspected that some combination of maternal and fetal biological protection is at work. The new research from Hopkins, however, suggests that the protective system is not perfect and that antibodies are not only made but are re-circulated back to the fetus through the placenta, possibly triggering inflammation in the brain and leading to a cascade of neurological changes resulting in neurodevelopmental disorders, such as autism. Autism Science Foundation - Doesn't Science Require An Open Mind? The Autism Science Foundation, a new purported autism advocacy group, has been formed and announced to the world. • Vaccines save lives; they do not cause autism. Numerous studies have failed to show a causal link between vaccines and autism. Vaccine safety research should continue to be conducted by the public health system in order to ensure vaccine safety and maintain confidence in our national vaccine program, but further investment of limited autism research dollars is not warranted at this time. "One question (is) whether there is a subgroup in the population that, on a genetic basis, is more susceptible to some vaccine characteristic or component than most of the population, and may develop an ASD in response to something about vaccination. We know that genetic variations exist that cause adverse reactions to specific foods, medications, or anesthetic agents. It is legitimate to ask whether a similar situation may exist for vaccines"
Given the existence of legitimate questions concerning possible vaccine autism questions it seems odd for an organization founded to provide quality scientific research to make such a dogmatic statement conclusively ruling out those very questions. It also seems odd that the founders of this organization believe that public confidence in the vaccine program will be maintained by shutting the door on areas of research in which substantial numbers of the population believe are legitimate areas of inquiry - including members of the public like Dr. Bernadine Healy, Dr. Julie Gerberding, Dr. Duane Alexander and Dr. Jon Poling. Personally, this father of a 13 year old autistic boy does not have a rigid view of the vaccine-autism issues. While I once accepted without serous question the official view of these issues I have changed my position. While I have not concluded that vaccines or vaccine ingredients cause autism I now have an open mind on the issues, largely because of the views expressed by credible people like Dr. Healy. As a lawyer I can also not ignore the fact that some of the vaccine cases have resulted in settlements in favor of the plaintiffs where a vaccine-autism connection was alleged, particularly in the Banks and Poling cases. Personally, this humble member of the public would have greater confidence in the safety of vaccine programs if more research of the type suggested by Doctors Healy, Gerberding and Alexander were conducted and the results were positive than by the incessant repetition of the dogma that the vaccine-autism link has been disproven. It has not. And many members of the public know that. It is time to do the research and move on. Hopefully the "Autism Science Foundation" will stick to advocating FOR research of possible autism causes, and treatments, and not spend its time simply promoting the view, not shared by all, that there is no possible vaccine- autism connection. The United Kingdom is not the only jurisdiction in the world with a higher rate of autism diagnosis than the 1 in 150 estimated by the CDC or the 1 in 166 to which the Canadian Neuroscience & Neurodiversity establishments cling. In a series the likes of which is unlikely to surface at the New York Times, the Globe & Mail or the CBC, 'On the Trail: Autism and the Environment', the Bloomington Alternative examines autism in relation to environmental toxins. In Indiana: High rates of autism, toxic pollution, the Stephen Higgs, continues his autism and environmental toxins series at BA with a report on Indiana's high rates of autism and toxic pollution noting that Indiana's identified autism diagnoses rate changed from 1 in 128 to 1 in 113 in one year. The Denialists will point, yet again, to the change of diagnostic criteria back in 1993-4 as an explanation for this latest increase in diagnoses in Indiana. They will offer no actual study to back up the claim, a claim that grows weaker each time it is trotted out to explain a new increase in autism rates, and as we move further away in time from 1994. Seriously, 15 years after the change in DSM autism definitions it is no longer credible to point to the 1994 DSM change as a full explanation for the startling increases in diagnoses. It is time to look at ALL possible environmental causes of autism from vaccines to industrial plants and toxic toys and jewelry. It is not enough to scoff and pretend to be "scientific" while denying, refusing to look at possible causes of autism as suggested by facts and evidence. Yesterday was a perfect day in Fredericton with a clear blue sky, sunshine and a gentle breeze most of the day. Conor started out relaxing with Mom but got out for some fun throwing rocks, checking out the ducks at the wetlands foot bridge near our home and just strolling along the Saint John River.